Recombinant full length protein corresponding to Human ARL4D. B16 (mouse melanoma) cell lysate and Human fetal kidney tissue. Lyophilised:Reconstitute with 200ul distilled sterile water. Please note that if you receive this product in liquid form it has already been reconstituted as described and no further reconstitution is necessary. Our Abpromise guarantee covers the use of ab169925 in the following tested applications. WB 1/500 - 1/1000. Predicted molecular weight: 22 kDa. Small GTP-binding protein which cycles between an inactive GDP-bound and an active GTP-bound form, and the rate of cycling is regulated by guanine nucleotide exchange factors (GEF) and GTPase-activating proteins (GAP). GTP-binding protein that does not act as an allosteric activator of the cholera toxin catalytic subunit. Recruits CYTH1, CYTH2, CYTH3 and CYTH4 to the plasma membrane in GDP-bound form. Belongs to the small GTPase superfamily. Arf family. Nucleus > nucleolus. Cell membrane. Nucleus. Cytoplasm. 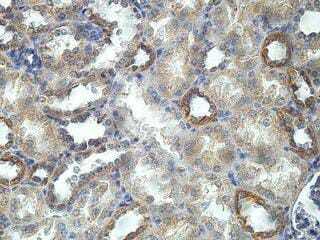 Immunohistochemical analysis of formalin-fixed, paraffin-embedded Human fetal kidney tissue, labelling ARL4D with ab169925 at 1/100 dilution. ab169925 has not yet been referenced specifically in any publications. Publishing research using ab169925? Please let us know so that we can cite the reference in this datasheet. There are currently no Customer reviews or Questions for ab169925.